Can connected devices change the way millennials perceive and spend money? Float is the world’s first personal finance related ecosystem of connected devices to track and manage short and long term finances. This project is an ongoing research collaboration between Carnegie Mellon University and PNC Bank and aims to explore how the use of smart ambient products can give physical presence to digital money and transactions in ways that positively influence personal financial decisions among millennials. The devices that we coded and built are being beta tested in 5 households. To understand millennials’ spending and saving behavior. To learn about existing products in the finance - IoT space, and to analyze why they may or may not be popular among millennials. How are millennials spending? What type of investments are important to them? Do these users budget? If so, do they use any tools or services to help them? PNC Bank wanted us to develop a personal finance connected product for millennials. As a team, we decided to explore how ambient devices that add a physical layer to digital transactions could positively influence millennials’ spending habits. We started out by understanding more about our target users. Our target users are earning Millennials who are independent and operate their own finances with spending accounts to their name. They live in the US. Millennials are the first generation of digital natives, and their affinity for technology shapes how they shop. A study of existing research showed us that they are used to instant access to price comparisons, product information and peer reviews and rely on these to make purchase decisions. Some of our findings have been described in the adjacent infographic. Next, we researched personal finance apps and services that currently exist, and that are popular among millennials. Miscellaneous ones (such as Plaid, AllPoint, Credit Sesame, etc.). We looked into these further. We also found two internet connected devices in development/ market; ‘Porkfolio’, and ‘Pavlok’. Continuous access to technology and the internet has led to millennials not wanting to sacrifice the current quality of their life to account for a better future. As a result, they are not preparing financially for their future. Personal finance apps are very popular and widely used for budgeting and saving, with 28% of millennials relying on them for budgeting, but the market for these types of apps is already heavily saturated. Based on our secondary research, three different focus areas that affect personal finance emerged; impulse purchase, budget tracking, and long-term investment - and we sought to explore these further. To collect quick, high-level data from millennials regarding their behavior around impulse purchases, budgeting, and saving for the future. To identify opportunities for connected devices based on the trends and patterns observed in the survey results. 35 millennials responded to the survey in a period of 2 days. We collected demographic information to identify interview participants. Users were asked about how they feel about their current finances, and their financial plans for the future. They were also asked about how stressful different aspects of finance are for them. Participants usually shop online once a week to once a month. However, 58% of the respondents make unplanned purchases, with 26% of them reporting that half or more of their purchases are impulsive. We found that budgeting was generally stressful for these millennials. They felt that getting close to the budget limit or spending more than it was particularly stressful. Unexpected purchases also cause significant stress. 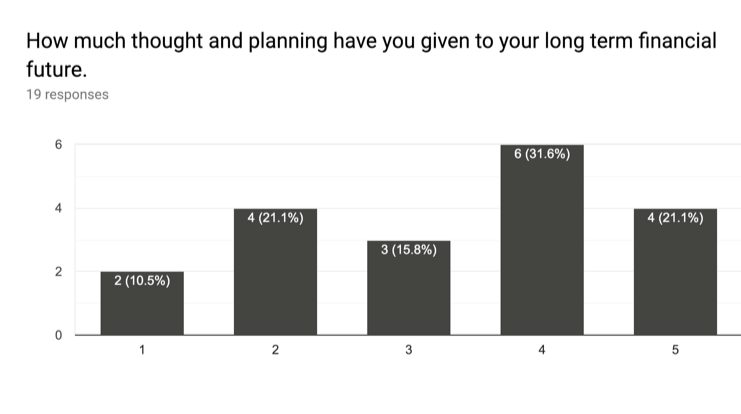 On a scale from ‘none’ to ‘a lot’, more than half of the respondents have thought quite a bit about their long-term finances. Generally, respondents prefer talking to people they know and trust about long-term financial planning. In order to improve overall financial well-being, we realized that each of the 3 focus areas would require device intervention at different points in time, and operate on different decision making time-frames. As a result, we decided to research, build, and test an eco-system of 3 connected devices. To learn in more detail how millennials manage their budgeting, impulse spending and savings. To understand how users feel about ambient devices to help with personal finance. To explore how users see these products fitting into their lives. To receive feedback about our eco-system framework. How do the users currently manage their finances? What are the issues they face when trying to understand financial concepts or manage transactions? What do they think of when they hear of connected devices for finances? Can they see themselves using such devices? What factors would they consider before investing in this system? We conducted in-person interviews with 8 millennials found through convenience sampling. As an introduction to the devices we plan to develop, we also showed them the framework and flow diagram of the 3 devices (for the 3 focus areas) to gauge their interest and learn about what millennials feel about the use of IoT devices for financial tracking and stability. Here, device 1 tracks impulse purchases. Device 2 helps with budgeting and everyday spending. Device 3 looks at long-term financial goals and savings. My teammate and I went through the interview transcripts together and found interesting quotes that provided insights. Based on these insights, we decided on the next steps. Participants struggled to imagine what an ambient device to help with finances might look like. They kept gravitating to the concept of a screen based interface and could not visualize or imagine a physical representation of finances, because they haven’t seen anything like it before. 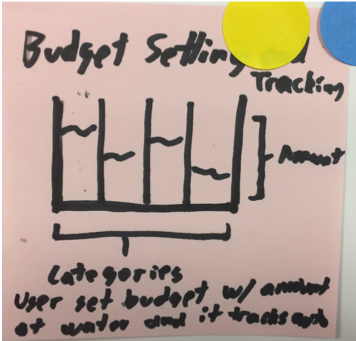 Users prefer keeping track of their budget and spending in their mind and always have a general idea of how they are doing currently. Most of the interviewees do not use any tool for explicitly for budgeting. They don’t feel that knowing their current spending in exact dollar and cent amounts at every point in time is helpful. While four of them did admit to trying Mint for some time, only two of them still use it. However, even the two Mint users claimed that they still track their budget in their mind. The definition of “impulse purchase” differs greatly depending on the individual. One considered his/her stock purchase as an impulse purchase while another considered a day trip as one. Four interviewees mentioned that their most frequent impulse purchases were food and beverages. On the other hand, another mentioned that she never makes any impulse purchases. Users weren’t particularly excited about using financial apps where they have to consciously log in and check their current balance or savings every time. 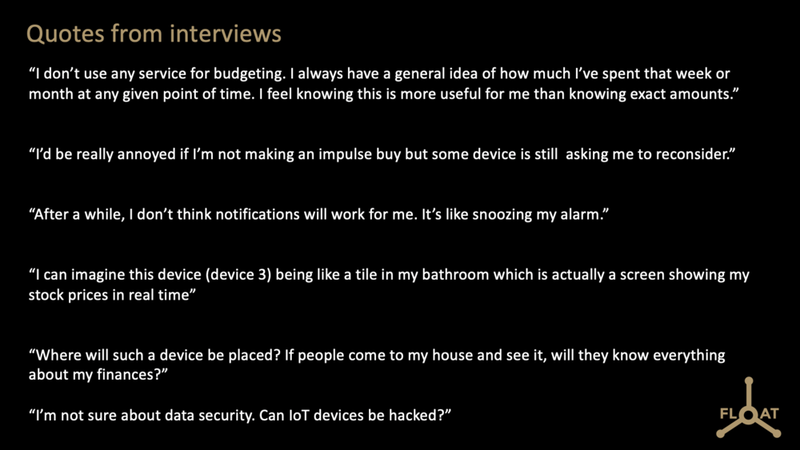 Almost all interviewees felt that they would like to have an ambient device that sat in their environment to inform them about the current state of their finances, since they felt it would be more glanceable, convenient, and easy to access as compared to finance-related apps. Participants are most concerned about the security of their data and privacy in the presence of guests when they thing about using ambient financial devices. Overall, all users were concerned about how secure their data would be if they used a device that was constantly interacting with their online banking services. They wanted to know if it would be easy for someone to hack into the device and steal their account details or their financial statements. Users are also concerned that the impulse purchase tracking device may become a nuisance, or that users could become conditioned to it. At least two people compared it to becoming a snooze button on an alarm clock. Users are wary of any negative reinforcement that the devices may employ if they are not on track. This was another common theme that emerged. In some cases, this included the notifications on the impulse spending device. Based on the insights from the interviews, we decided to start brainstorming and prototyping our concepts to test them out with our users along the way. A speed-dating session was conducted with 32 participants (who are all acquainted with the development of IoT devices) for ideas for personal finance related connected devices. Next, we went through these ideas as a team, refined them and brainstormed more IoT device concepts that would alert users about their current financial status and changes in real-time. We classified all these ideas based on the type of notification or indication of change that they would provide. We identified the 3 best ideas for each of the focus areas by voting based on feasibility, suitability of that concept for the required function, and the the element of fun that it would introduce. Prototypes for all 3 devices were made using the Particle Photon micro-controller and basic electronics. We also paid attention to the form factor so that the participants would be able to visualize such a device in their home or on their person. 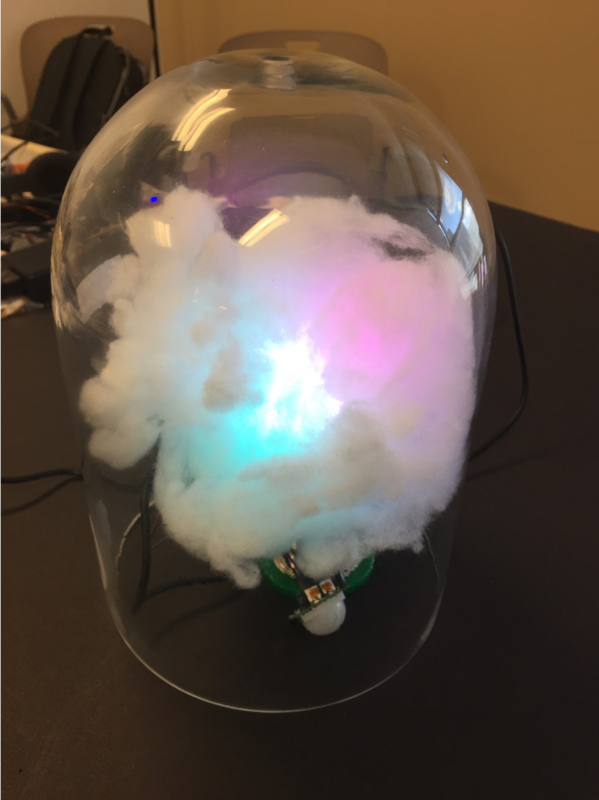 Initially, we explored devices which looked like practical decorative items, like wind chimes and photo frames, as well as curious objects like a cloud in a bell jar or a light-box. We wanted to understand user’s feedback with respect to appearance, utility, and data privacy and security. We looked at various form factors - like practical items vs curious objects, and also explored different types of interactions - like light based vs glanceable visual cues. We prototyped devices which would allow saving for multiple goals (lightbox and led panel) and those that looked at singular overall savings (unfogging photoframes). We built and tested prototypes that rewarded good behavior (image 1- candy dispensing device) and ones that show the status of amount spent on impulse purchases on that day (stress ball, color changing test tubes and thermochromic octopus). We also looked into friendly competition and gamification to limit impulse buys. We conducted A/B tests with each iteration of the prototypes of each device to finalize on their form factors, interactions, the type of data they would display and their data visualization. 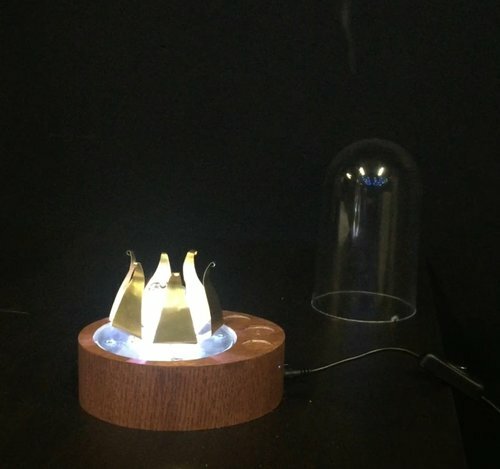 Participants were excited about curious objects as ambient finance notifiers, rather than decorative items like wind-chimes. They felt that curious objects, like the cloud in a bell jar, would fit into any house with any decor or interior design scheme, and add a feeling of intrigue, unlike photo-frames. The glanceable nature of the status had positive reactions from users. They did not want to see exact dollar amounts, nor did they want to have to log in to an app to check their status every time. The curious object form factor of devices 1 and 2 convinced users of data privacy when they had guests over. But, they wondered what would happen if their guests also had the same devices and knew exactly how to interpret the data. Users were still concerned about data security. We were conscious about data security while choosing services to create the Float ecosystem, we made sure to use reputed services like Plaid for APIs and to provide 128-bit encryption. 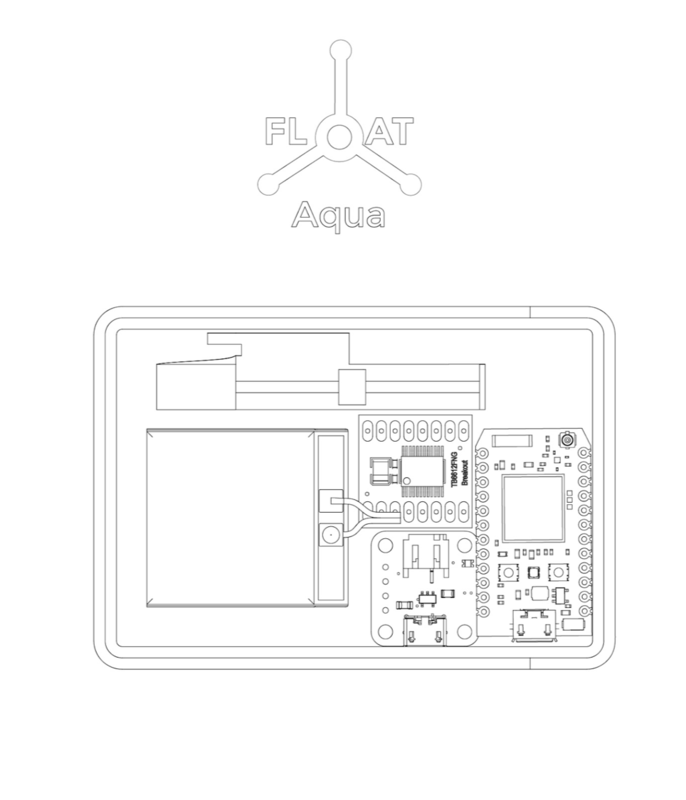 The video below demonstrates the initial concept of how Float, as an eco-system, would function. The 3 devices communicate with each other through an online platform to help the user keep track of their finances in real-time. 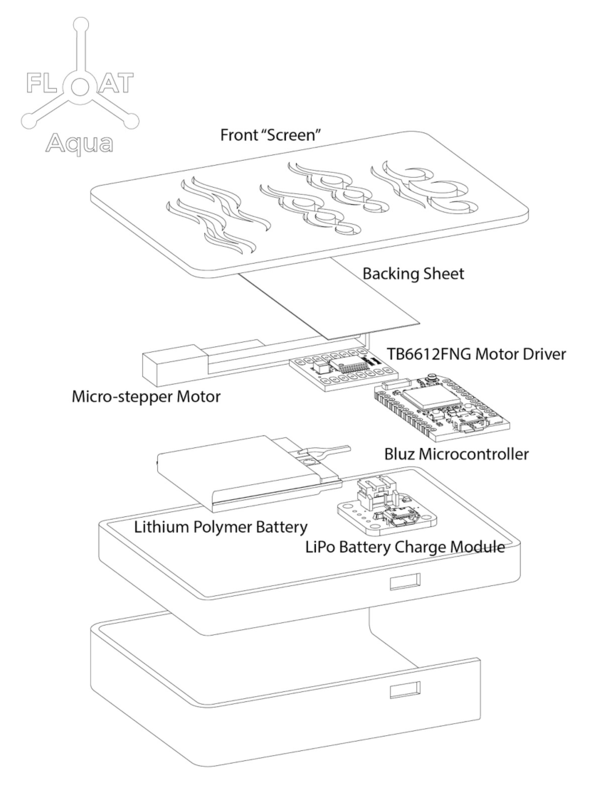 The devices - Sola, Flora, and Aqua, have been described below. Sola helps the user track their budget. It is a curious object and is kept at home. 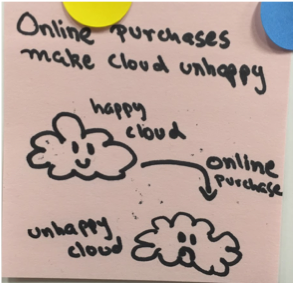 The color of the cloud indicates the current budget level and the balloons indicate what the user has spent their money on. The height of the balloons are controlled by servo motors that wind and unwind wire based on amount spent by users on certain types of items or vendors (like Starbucks or Uber) that they have identified and selected to control. The user knows how close to their savings goal they are when they place a representative token (can be custom-made in the shape of a house, car etc.) in Flora. The flower petals open and light up based on how much the user has saved towards that goal. The mechanical interface adds an element of wonder. 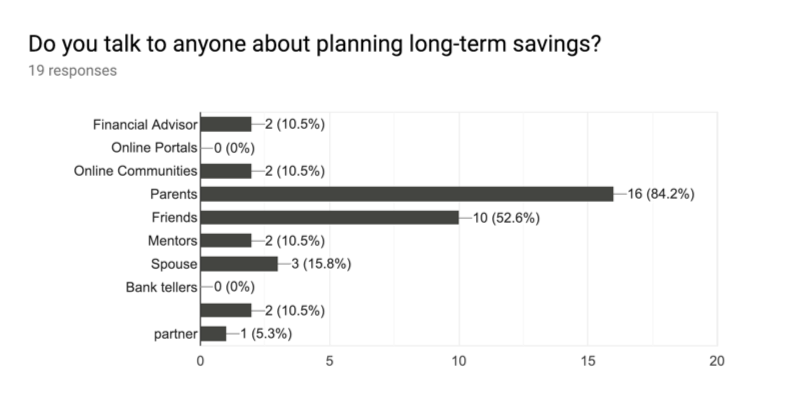 From our research, we found that users were generally more fearful of long-term savings. We wanted to develop a form that invited users to play with it and created a sense of wonder. We created a moodboard of playful interfaces that we found and thought up ourselves before we decided on the ‘mechanical flower’ form factor. The images below also show the basic functional online interface for Flora and the resistance values for the tokens. We finalized the concept for the third device before handing it over to the next batch of student researchers for development, but could not create a polished prototype due to time constraints. The images show an attachment for a mobile phone case which shows current spending as a colored background for the wave cutout in the front sheet. The level of colored waves indicates how much the user has spent versus how much they’ve saved, or as a competition with their own spending on a randomly chosen previous day. After finalizing and refining Sola and Flora, 20 of each device were fabricated. These were demonstrated to PNC and prepared for beta testing with users. Representatives from PNC Bank were fascinated by our take on ambient devices for personal finance and excited to see how users might interact with these devices. Users who fit our target category and lived in Pittsburgh were identified for a trial run of the devices. The design and fabrication of Aqua was handed over to the new researchers joining the project, along with our fabricated Solas and Floras. They took over the project and proceeded with beta testing and development of Aqua. Since this project involved a lot of generative research, we did not have any frame of reference or any artifacts to ask users to talk about or compare during our initial interactions with them. They were confused about what ambient finance devices might be, and it caused some frustration among the team about what the next steps might be. We had to change our approach and start prototyping from the very beginning. I found out that electronics components can be very temperamental, especially when multiple prototypes have to be made. I had to learn to be patient and to take advantage of online resources to help me debug any issues. Wifi problems taught me to always have a backup plan and think out of the box. Overall, this project opened my eyes to a future where digital products can come out of the confines of a flat 2-dimensional space and move into the real world. Given my engineering background and previous experience with physical products, I look forward to such a future.